Christmanns Gutsriesling dry comes from various vineyards in Deidesheim, Gimmeldingen and Ruppertsberg, as well as from pre-harvests in classified crus, in which grapes are harvested, that have an early maturity. 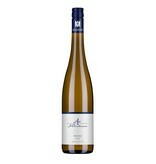 So it is made from fully matured Riesling berries and thus has a ripe acidity and fine clarity and minerality. The wine is not chaptalized and bottled untreated after maturing in stainless steel tanks and traditional wooden barrels. James Suckling rates the 2017 Gutsriesling fabulous 91/100 points. An extremely high praise for this class.